ID Tech MiniMag 2 - USB, Black, Keyboard Emulation, Reads tracks 1 & 2. Includes USB cable. Cable exits from bottom of unit. 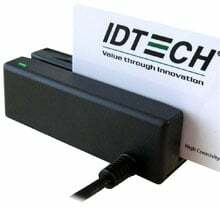 The ID Tech IDMB-3341-12BX is also known as IDTech	IDT-IDMB334112BX	or IDMB334112BX	.